between what’s bad or maybe worse. in hues of skin or acts of faith. I dread when bombing is defense. Fireblossom challenges us to write about what we dread at toads, and you might dread many things, but right now I seem forced to choose between different variants of more or less fascist ideologies. Simplicity seems to be ruling right now, long live the grey zone., and it’s not just Daesh that hate the grey-zone, it’s applicable to all other kinds of fascism that is on the rise. This is the norm now following the end of the cold war. After Vietnam one finds the conflicts shifted more towards ideological and religious stand-offs. It is providing an excuse to plunder weak nations, a provocation in the name of defense. Very incisive lines Bjorn! 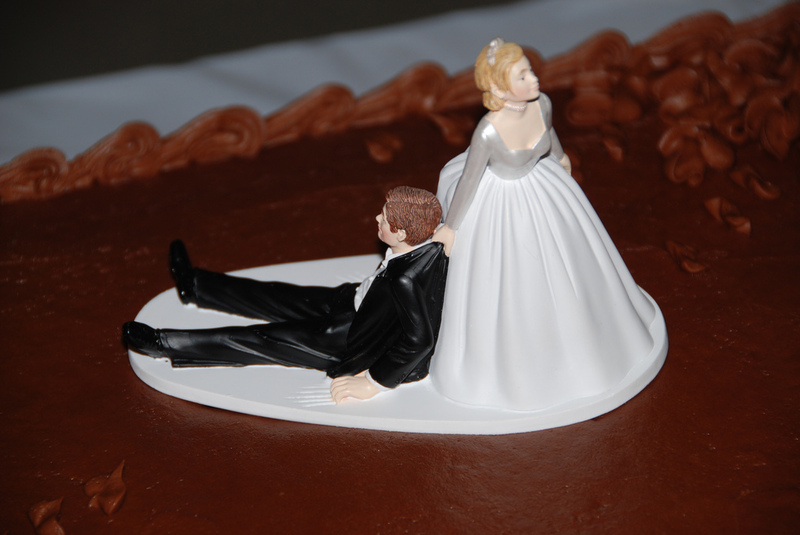 That is a hilarious cake topper. I think we all dread that, Bjorn. The world is off its hinges. True dread. And so well said. Still, the majority of people are good. If it was up to the people, and not world leaders, this planet would be much more peaceful. I liked your pick, you told it well. From my aspect shotgun weddings aren’t too bad if there is true love. It lasted thirteen years. Beats going to jail too. The parallels are frightening. My father experiences the atrocities of War. Had a gun held to his on three occasions, once by SS officers. He had to pick up the dismembered head of a friend of his that worked in a pub, and place it in a bucket shortly after a bombing, being ordered to do so by the Germans. It send chills down my spine, what he experienced and what is happening today. It’s not so much the scale (yet) but the voices and ideologies that pour dread into my heart.. I dread the next year of European/ Eurasian history. The world is on the brink of war… it may already be too late. I think we need to voice the fear and act in time..
Yeah no kidding. This is some serious dread! As an aside, your text font is different I think? Or at least it seems so on my computer. I like the new one! Very much! That photo is amusing. The choices aren’t much a choice and all options are frightening, especially when bombing is defense. When bombing is defence and collaterals are accidents it sounds like Orwell to me. The idea of a shotgun wedding is so interesting to interpose here–the difficult choices–all very imperfect–thanks, Bjorn. k.
Oh yes, it is recurring as we speak yet is it really worse? I think it is in many ways. Very thoughtful poem! Oh, that is so happening in this country. I’ve had to rid myself of some people on Facebook. No one wants to talk peace. Somehow that makes a person an enemy. How we handle personal differences and political often aren’t so very different. Passive and aggressive behavior obviously are traits that are needed at times – wisdom is knowing when, I suppose. Fighting at times is necessary … Yes, the world is really building up to something – let’s hope wise heads prevail. A brilliant analogy – the title of the piece: hammering in the absurdity of knee-jerk commitment (of any kind, including politics).